This turn-based strategy game for Nintendo Switch offers local and online matches* for one to four players. Each player takes control of an army and its commander unit to wage war on their enemies! Wargroove is extremely easy to pick up, with accessibility at the forefront of its design, and very difficult to master, with deep gameplay mechanics that complement strategic play. Choose your Commander! – The Commanders are at the heart of Wargroove – a cast of exciting and energetic characters who each have their own distinct personalities and motivations. As well as acting as your avatars in-game, your Commanders will also be able to fight alongside your army as powerful units on the field. Be careful though – if they fall the battle is lost! Get into the Groove! – Each Commander can use a special move called a groove, which can be activated once their meter has filled to 100%. Each groove is unique to the Commander, and changes up the battlefield in an entirely different way. For example, the Cherrystone Kingdom’s Mercia can use her groove to heal adjacent units, whereas Valder of the Felheim Legion uses his groove to conjure the undead, spawning a new unit. Create your own Adventure! – Easily make the game your own, by crafting custom scenarios and maps using the in-game editors. There are endless possibilities, from creating your own story-driven missions with sub-quests, plot twists, ambushes and hidden secrets, to easily changing the rules of the game without any mods or external tools. Battle the Elements! – Weather adds a degree of unpredictability to battles. Will favourable winds give you that extra push you need to reach an enemy, or will a blizzard bog your units down in snowdrifts? Weather forces Commanders to think on their feet when conditions change. Merging face-melting heavy metal rhythm riffs with a high-octane zombie-crushing shoot ’em up, Double Kick Heroes is like no game you’ve ever seen before! You must survive on the highway to hell by slaying monsters with your gundillac! Struggle through the 30 levels of total madness and escape from this nightmare! Only the power of metal can save your band! It’s time to get carried away with the deliriously fun, bloody physics-based construction puzzler packed full of creative challenges, sports and bloody disasters! OVER 100 CHALLENGING LEVELS – Construct various facilities and infrastructures such as chairlifts, gondolas, jumps, bridges and ramps to guide the riders across over 100 hazardous levels. Build increasingly impressive structures as you progress through the varied campaign using your materials wisely. Cutting corners will save money, but it may compromise passenger safety with hilarious consequences! ORIGINAL PHYSICS PUZZLES – Jump into the fabulous role of a mountain resort engineer and master the ropes physics; learn the stresses and strains that will impact all the different types of structures that you’ll build. Change between Build Mode and Simulation Mode whenever you want. EXTREME SPORTS – After the construction – enjoy some sports! From Winter to Summer activity, try snowboarding, skiing, motorbiking, peddling and more…Take control of your rider and feel the mountain air to give them an extra nudge towards their destination and claim that coveted Number One leaderboard spot. TOP OF THE ROPES – Keep an eye on your budget and tick off all the bonus objectives to be at the top of the online leaderboards. Grab all the trophies and enjoy puzzles from simple green to extreme black difficulty. SANDBOX BUILDER MODE – Once you’ve mastered the slopes of When Ski Lifts Go Wrong, create your own in the easy-to-use level builder where your only limit is your imagination. SOCIAL SHARING – Share your proudest or most disastrous replays, figures and creations with the community via the Nintendo Switch Capture button. Forager is a 2D open world game inspired by exploration, farming and crafting games. Start small and improve your base, skills, equipment, network of friends (and enemies!) and build your future as you see fit! Inmost is an atmospheric, story-driven puzzle platformer, following three playable characters within one dark, interconnecting story. CrossCode combines 16-bit graphics with butter-smooth physics, a fast-paced combat system, and engaging puzzle mechanics, served with a gripping sci-fi story. This 2D action RPG is coming to Nintendo Switch in 2019, with a whole host of exclusive content! 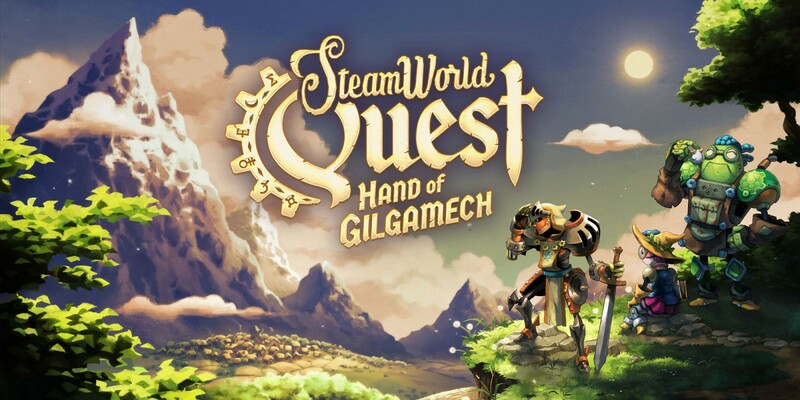 Out of this lot, I’m personally looking forward to SteamWorld Quest: Hand of Gilgamech, how about you guys?